Use a soft brush with a mixture of mild soap and warm water to clean the seat belts. Let the belts air dry. 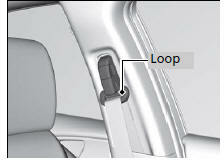 Wipe the loops of the seat belt anchors using a clean cloth. Do not spill liquids inside the vehicle. Electrical devices and systems may malfunction if liquids are splashed on them. Do not use silicone based sprays on electrical devices such as audio devices and switches. Doing so may cause the items to malfunction or cause a fire inside the vehicle. If a silicone based spray is inadvertently used on electrical devices, consult a dealer. Depending on their composition, chemicals and liquid aromatics may cause discoloration, wrinkles, and cracking to resin-based parts and textiles. Do not use alkali solvents or organic solvents such as benzene or gasoline. After using chemicals, make sure to gently wipe them away using a dry cloth. Do not place used cloths on top of resin based parts or textiles for long periods of time without washing.